Migraines can be debilitating. A migraine headache can cause intense throbbing in your head, nausea, vomiting and sensitivity to light. It is not uncommon for migraines to last more than a few hours. While doctors do not know what exactly causes migraines, researchers believe genetics and environmental factors can play a strong role. Ninety-percent of patients report a family history of migraines in at least one other relative. Common triggers for migraines are hormone fluctuation in women, certain foods like salt, cheese, food additives, caffeine, alcohol and stress. 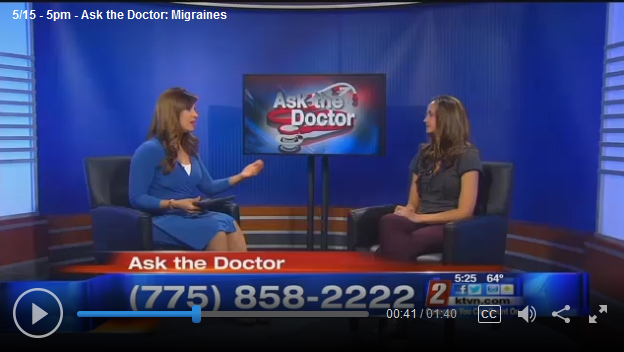 Tonight’s Ask the Doctor guest will talk about Botox as an option to treat chronic migraines. Ashlie Teixeira-Smith is an Advanced Practice Registered Nurse with Sierra Neurosurgery Group. She says patients who experience headaches 15 or more days a month or more than eight migraines a month – for at least three consecutive months – are considered chronic. She uses Botox to treat those suffering with chronic migraines. Teixeira-Smith says if other medications have not worked and if your headaches or migraines – without treatment – last more than four hours, you might consider Botox. According to the FDA, Botox to treat chronic migraines is given at intervals of about three-months. The multiple injections around the head and neck can dull future headache symptoms. To learn more, Ashlie Teixeira-Smith, MSN, APRN will be our “Ask the Doctor” guest tonight during our 5 o’clock newscast. To speak with her during regular business hours, call Sierra Neurosurgery Group at (775) 323-2080.